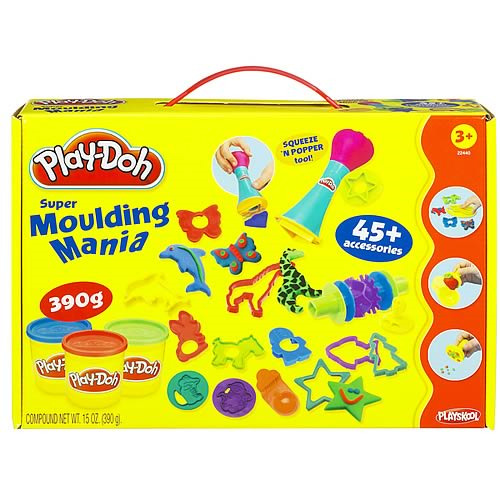 With three cans of Play-Doh compound and more than 45 different cutters and accessories, the Super Molding Mania Set offers endless possibilities for creative play! The Super Tools Squeeze 'n Popper tool lets you mold a shape and then pop it right out with a simple squeeze. The Play-Doh Pick Up Stick tool helps remove creations from molds and makes cleaning up easy. This fun set includes 45 cutters and accessories, Play-Doh Pick Up Stick and Super Tools Squeeze 'n Popper tools, and three 130g cans of Play-Doh compound.